My StitchFix referral link if you're interested in checking it out. My PageHabit referral link if you're looking for a new book subscription club. And if you don't want to use the referral links, just google any of those titles and you'll be able to find all sorts of information easily enough. No worries--I won't be offended! Sandy update (and I've touched fibers, so there's an update! ), a bit about clothing, and a lot about organizing my embroidery thread stash. Plus a book review! Ahem. It's been awhile. Howdy, strangers! In this episode, I update you on a few finishes that happened since the end of June, and talk about current and future projects. Welcome to my 200th episode! Since I missed my 6th podcastaversary back in March, I'll take this opportunity instead to give some stuff away! Look underneath the podcast player for information about my 200th episode giveaway! In this episode, I talk a little bit about vacation but mostly about what I've been up to in my sewing room and embroidery-wise. I've been making progress! Plus, the ever-favorite-of-mine, listener feedback! Later note: I misspoke in this episode and said both embroidery projects I have going are Lynette Anderson designs. They're not. I got it right in the related blog posts, though--the Christmas ornaments are Lynette Anderson, the Halloween BOM is Bunny Hill Designs. My bad! Which means it seems to be time for a giveaway! Enter to win these fat quarters and the "Quick Turn tool" (sold in a variety of places but it's come in particularly handy on my Annie Unrein projects--she sells it on her website at www.byannie.com.) The Quick Turn tool is an easy way to turn fabric tubes right-side out again--something you do a lot of in making accessories. What would you love to do 200 times? I've loved posting 200 episodes. I've loved the conversation, the comments, the challenge, and making new friends via the airwaves (or the fiber optic cables, whatever). I love seeing pictures of what y'all are working on, and I love getting your excellent tips for how I could avoid completely screwing something up the next time I work on it. I love being inspired by your projects and I love it when you poke at me to keep going when I'm ready to toss it in. Thanks for 200 fun times, and I'm looking forward to more! Also, I'd love to eat 200 pieces of chocolate. Although probably not all at once. That might be gross. So--leave your comments--what would you love to do 200 times? In this episode, I talk about my current--finished!--quilt project: that now-infamous Annie Unrein cosmetics bag. But then I obviously will not let Annie win as I'm going back to the well for another couple of projects, also referenced in this episode. A brief reference to the Jacob's Ladder quilt and another couple of projects I want to do in upcoming weeks. After all the quilty talk is done, I share some changes I've made in the last few weeks that have made a vast improvement to my physical and mental health. But I do let you know when it's coming so you can turn off if you're just interested in quilty stuff. Twilter block swap: Birds in the Air block--check out the Twilters group on Facebook. If you're not a member, let me know. 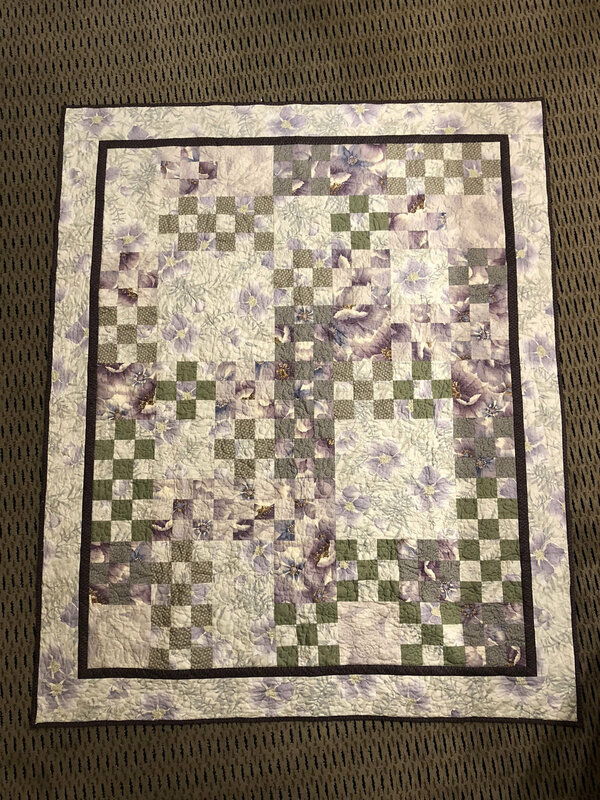 To visit Frances' podcast and blog (and information about Birds in the Air), The Off-Kilter Quilt, click here. This is a bit of a random catch-up episode but I do talk a fair amount of fabric and quilty stuff! Gretchen Rubin's The Happiness Project, Better Than Before (the book), Better Than Before (the journal), and Happier at Home (currently on sale for $1.99 on Kindle). She and her sister also have a podcast, "Happier with Gretchen Rubin," available on iTunes and Stitcher, and probably lots of other places. In this episode, I announce the winner of the 2016 Quilty Resolutions Giveaway, and talk about some quilty goings-on in my life. Woo! I've touched my sewing machine! "Walking in Love" interactive art project: www.adelehan.com/interactive-art-project-walking-in-love, and on Facebook at https://www.facebook.com/walkinginlovestory/?fref=ts. No show notes this time: just an update on what's happened over the last few weeks. In this episode I report on how I did with my 2015 Quilty Resolutions and what it meant to have a Word of the Year; I also remind y'all what your 2015 Words of the Year were and ask for updates! Then we turn to 2016 Quilty Resolutions. I share mine, and then once again invite you to share yours and enter my giveaway. I end the episode by talking about a few books I've found helpful in helping me with crazy quilting, embroidery, and beadwork. 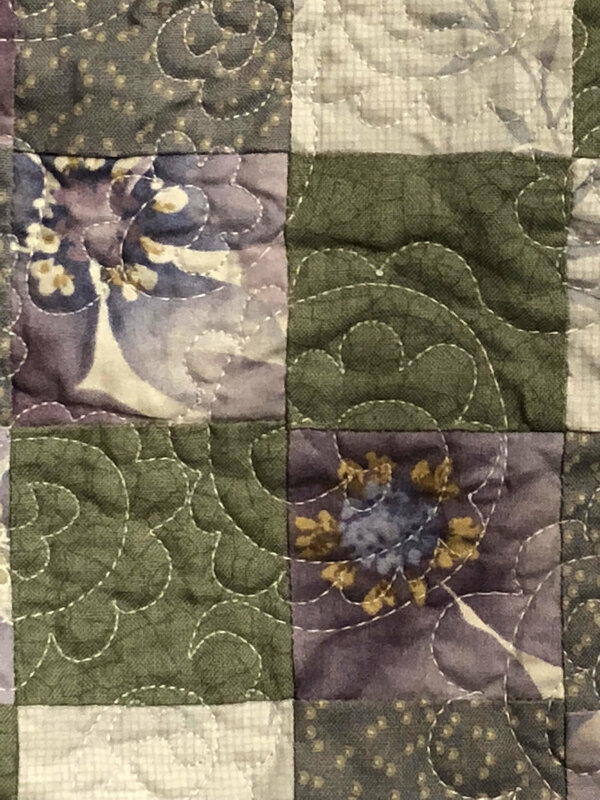 Please note: I have now posted the Quilty Resolutions submission form here. 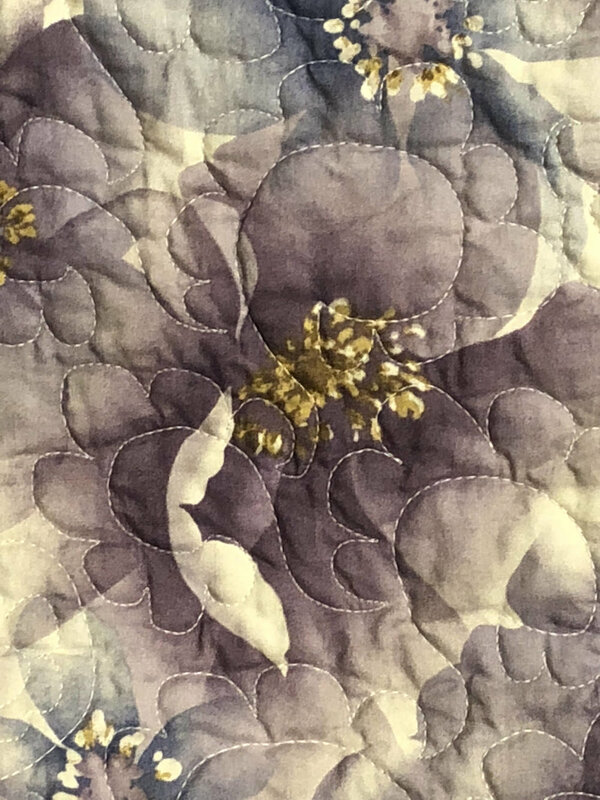 In this episode I talk about a family emergency that turned into a quilty project; I also discuss how to save embroidery projects from the trash can, and a little bit about de-gunking irons, all in the context of my current works in progress (or finishes). I also introduce the 2016 Quilty Resolutions Challenge concept, although the actual challenge won't launch on my blog for another several days. But this'll get you thinking! A little bitta bling--always hard to get a blingie picture, though! I can actually talk about quilting and embroidery and fun stuff now! Progress update on several embroidery projects and a bit about some quilting projects. I do talk about my school-related plans for the break until my January class, but I warn you when it's coming so you can just stop listening at that point if you'd like to; I do, however, end with listener feedback as usual. And by the way, I apparently have a complete mental breakdown by the end. Barely coherent, really. So it may be worth hanging in for the entertainment value. Daylight wafer light box that my friend has and I really, really want. And here's the real link for MeinkeToy, although I've also fixed it in that episode show notes as well. In this episode, I talk about all the fun we had for #BFSI (Black Friday Sew-In), announce the Boxing Day Sew-In (#BDSI), and update y'all on Jacob's Ladders and Pudgy Birds. Talk back to me this time, ya hear? 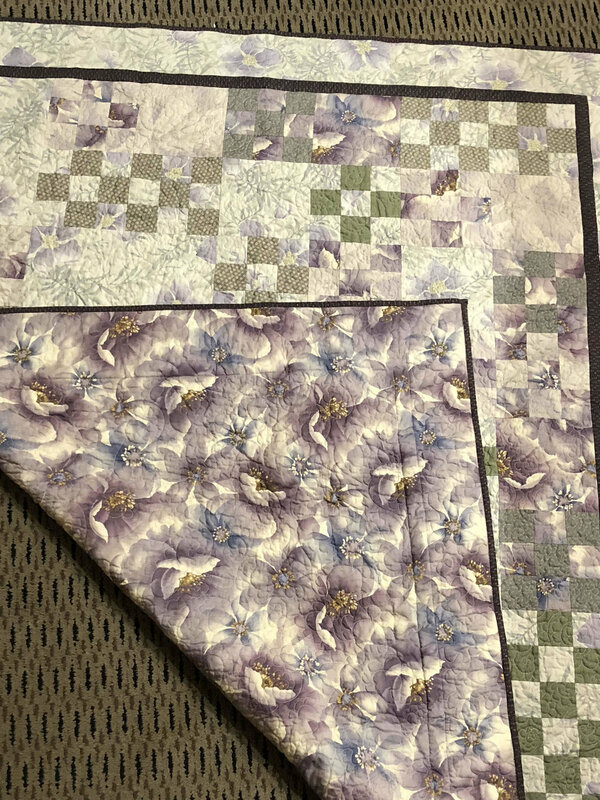 In this episode, I talk a little bit about school, about the sewing projects I've actually managed to get done, and about AQS QuiltWeek in Syracuse (attended on August 1st). For the blog post about my QuiltWeek acquisitions, click here. For the post about the totebag I made using one of the patterns I bought at QuiltWeek, click here. For the post with the Craftsy class review and pics of the zippered pouches I made, click here. To check out the Facebook Twilters group, click here.